There is a lot of friction at our dining room table when it comes to dessert; I enjoy super decadent bites of something and Damir enjoys slightly sweet plates of something. We differ in what we think an acceptable amount of sweets is and to what level of sweetness a treat should be. Our dessert palates are often not very equal. However, there is one thing we can agree on: cheesecake. Fluffy, rich, light yet filling amazing cheesecake. D-Money can eat an entire cheesecake and honestly I can match him (granted it would take me a couple of weeks to do the damage he can do in a week). We both agree that cheesecake is amazing. It’s the one dessert we can agree to order when we go out to eat and we both love trying new flavors. I stumbled on this simple cheesecake recipe and knew I had to make it because it has peanut butter as a main ingredient. Seriously, any dessert with peanut butter will make my day. Plus this recipe is no bake! 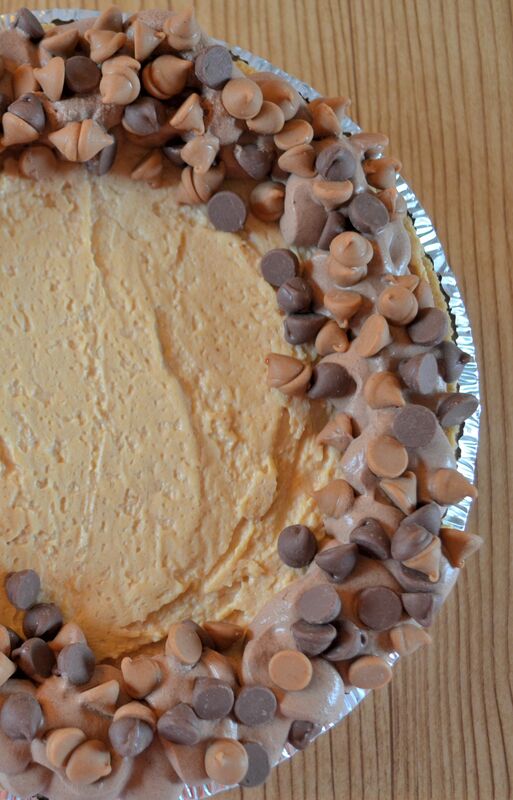 Cheesecake, no bake, and peanut butter? This is a recipe that needs to be book marked and made ASAP! We ate the cheesecake in 3 days. Blend the cream cheese, sour cream, peanut butter and 1 cup of the sugar until smooth in stand mixer. 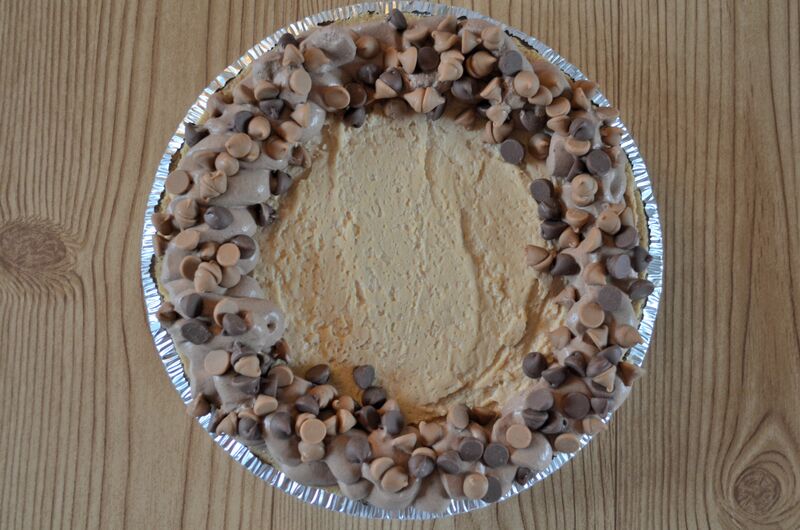 Sprinkle the chopped peanuts around the bottom of the pie crust and spoon the cheesecake filling on top, smoothing out the top and spreading the filling to the edge. Place a piece of plastic wrap directly on top of the cheesecake and refrigerate until set, at least 3 hours. Whisk together the heavy cream, cocoa powder and the remaining 3 tablespoons confectioners’ sugar in a medium mixing bowl until dissolved. Cover with plastic wrap and refrigerate. After three hours, whisk the heavy cream and cocoa powder mixture until peaks form. Place the cocoa whipped cream in a plastic bag and prepare the bag to use as a cake decorator by snipping a small corner open. Pipe the frosting around the edge of the cake. 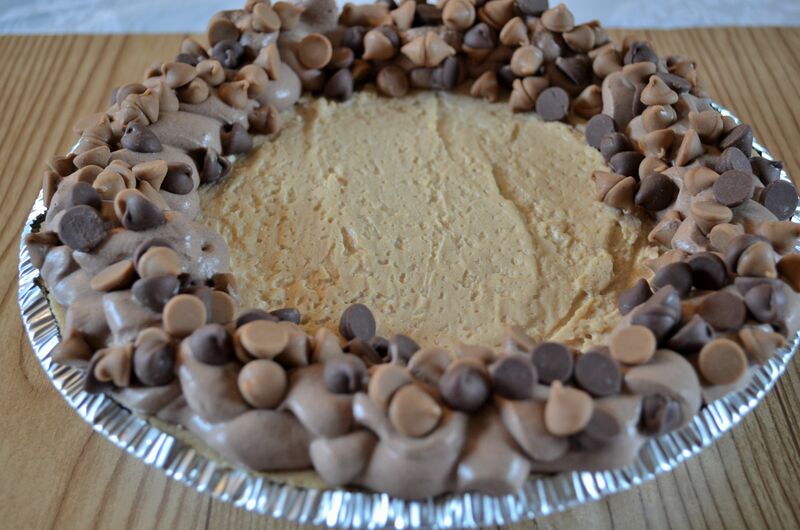 Sprinkle the peanut butter and chocolate chips over the whipped cream and serve. This looks delightful! YUMMY! My family loves peanut butter, so there should be no arguing about it :)! I tried the yummy burger recipe that you had posted and it was a hit! I felt like a real chef ( a burger chef). Thanks for your tips! YUM! I will definitely be trying this soon! My two fav things Peanut butter and Cheesecake!